In remote areas where illegal logging is most rampant, officials struggle with outreach to poor villagers about recently implemented laws that make most chainsaws illegal. Many times faster and more efficient than traditional handsaws and axes, chainsaws are also dangerous tools that can cause serious injury or death. Unregulated chainsaw use is nearly impossible for forestry officials to track or regulate, as most illegal logging is taking place in remote areas that are extremely difficult to reach. ALAUNGDAW KATHAPA NATIONAL PARK, Myanmar – Pyar Aung still remembers the first time he saw a chainsaw. It was a German-made number being used by one of the logging companies operating in the forest around his remote village in Myanmar’s northwest Sagaing region in 2013. A villager from Mahu poses with his chainsaw in front of one other source of meager local income: a mat made of dry bamboo. Photo by Ann Wang for Mongabay. 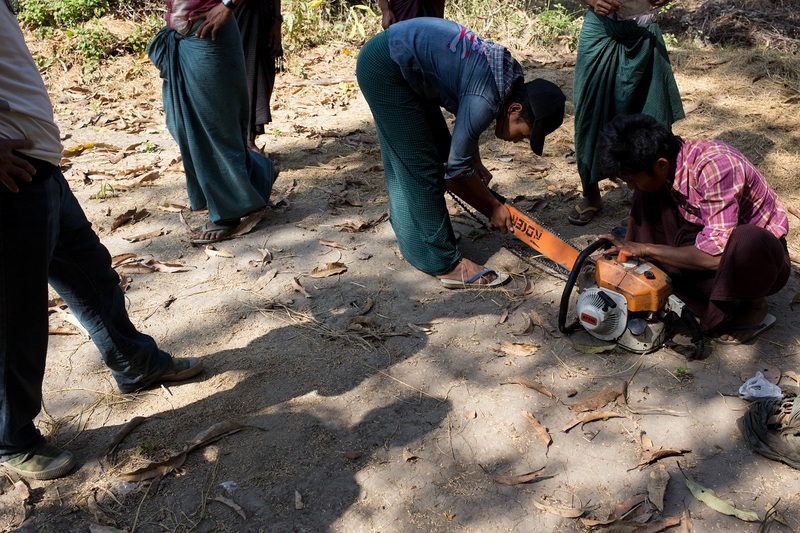 Despite almost non-existent knowledge of safety equipment, training, and protocols, chainsaws are gaining in popularity as the logging tool of choice in Myanmar’s rich forests. The country is the largest supplier of natural teak (Tectona grandis) in the world. Forestry officials say they began to see an uptick in imported chainsaws between 2013 and 2014. That increase, with numbers that are very difficult to track and verify, is likely in the hundreds to thousands per year. The UN’s Food and Agriculture Organization (FAO), which tracks forest cover globally, notes that between 1990 and 2015, the country already lost nearly 15 million hectares of forest and other wooded land. There’s no official data yet on whether a national logging ban in place from mid-2016 to April 2017 had an impact on forest loss. The geography of locales like Mahu — incredibly remote with limited options for income — contributes to illegal logging. It is completely cut off from the outside world for the 4-month rainy season due to bad roads. The national education system only arrived in the village five years ago, and there is still no electricity nor cell signal. Villagers are motivated by basic economics to own chainsaws for logging to expedite their work. Freshly cut trees, illegally logged, wait on the riverside wait to be transported from the forest to Mahu for sale. Photo by Ann Wang for Mongabay. Aung says that he can make about $95 per ton of logs. He typically collects 1.5 to 2 tons of wood per week to sell. If the rest of the village logs at a similar pace, they can cut down about 46 tons of wood every week, or over 180 tons per month. If they sell what they log at the rate Aung notes, the village can make at least $17,500 a month. A conservative estimate of annual village income from illegal logging — minus the rainy season — is about $140,000 annually. Altered to an inspection by the Forestry Department, villagers from Mahu take a chainsaw apart to hide parts in different locations in the forest. Photo by Ann Wang for Mongabay. In Mandalay, the nearest urban center for the timber market and commercial goods, people are a bit more savvy about the rules for selling and owning a chainsaw. Along Mandalay’s so-called “iron street” of machinery and tool shops, out of a randomly selected seven shops along a 40-block stretch, only one displayed chainsaws. Others wouldn’t even discuss a sale without proper paperwork. Fears of plainclothes police officers pretending to be customers are top of mind. 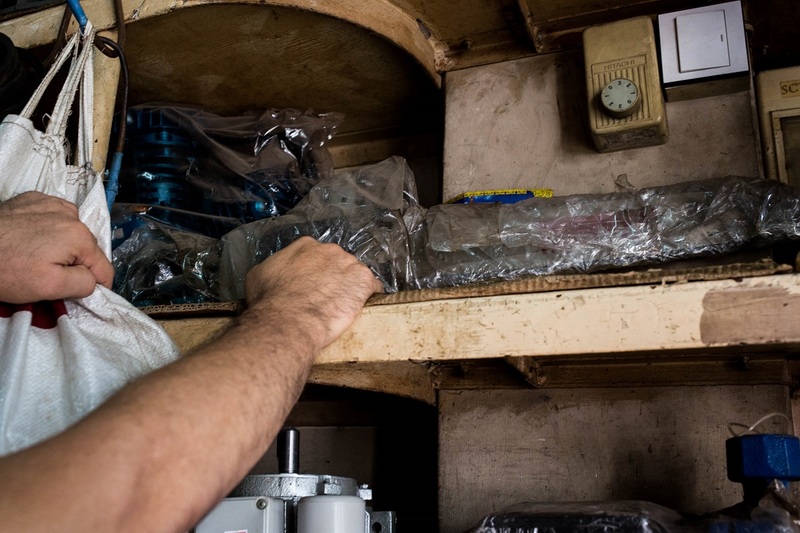 A vendor shows a chainsaw hidden behind other commercial products in a hardware shop in Mandalay, Myanmar. Photo by Ann Wang for Mongabay. Many other shops take a more subdued approach. Some put the chainsaw blades in the corner, but the rest of the equipment stays hidden in back storage rooms and are only presented on request. Win adds that a obtaining a license to buy a chainsaw involves answering a list of questions such as reasons for the purchase, which trees will be cut down, and the locations where the tool will be used. “It’s a very complicated procedure, I don’t understand the reason behind all this madness,” he said. “But I guess it’s the new government, and it comes with new rules.” The country held its first democratic election in decades in 2015 and brought human rights icon Aung San Suu Kyi and her party, the National League for Democracy, to power. In June 2016 Myanmar’s Forestry Department amended its forestry laws include a policy on chainsaw registration: Whoever uses a chainsaw without permission can be sued, face up to two years in prison, and/or a fine of up to $15. They also created a committee with police officers, local and regional forestry department officers, and township administrators to enforce chainsaw rules and regulations. That includes monthly reports from forestry departments in each township, district, division and state to headquarters in Naypyidaw. Combating the myriad aspects of illegal logging in Myanmar is already a huge job for authorities. Just as the national ban lifted in mid-April, officials announced that in the past year they seized 55,000 tons of illegal timber and 2,600 vehicles and pieces of machinery. Arrests of timber smugglers included 11 foreigners and 8,310 Burmese nationals. Myanmar is still in the early stages of regulating chainsaws, especially when it comes to import rules. Officer Phyo Zin Mon Naing is assistant director of Myanmar’s Forestry Department at Naypyidaw and oversees chainsaw registration. He said in an interview that he’s been working on issues regarding chainsaw registration since 2013, but prior to that there were simply no laws or regulations for chainsaws. In 2014, the government started to ask chainsaw users to register equipment, but the system was inefficient and difficult to enforce. The current procedure, which includes import laws, was put into place after discussion with various departments and the central government. A villager from Mahu cuts down a tree using a midsize chainsaw. A chainsaw can cut down a tree four times faster than an axe and handsaw. Photo by Ann Wang for Mongabay. The complex procedure requires importers to submit an inquiry for a permit to import chainsaws and present their import license and company registration to the Ministry of Commerce. The Ministry of Commerce then submits it to the forestry department for a recommendation letter. In order to issue a recommendation letter, the forestry department has to first check the chainsaw type, country of origin, import method, the number of chainsaws in the current stock, a list of chainsaw distributors by the company and other detailed information. The importer isn’t technically allowed to sell their chainsaws if they don’t agree to monthly reports on their distribution and stock. Naing believes that this system, which targets importers, distributors, and users of chainsaws, is feasible. For example, they once received an application from a machinery shop that wanted to import 20,000 chainsaws. The request was rejected. The numbers clearly aren’t exact, though. For example, the number of known chainsaws in the Sagaing region alone would be 16 percent higher if the units in Mahu village were registered. Yet despite known pockets of lawlessness like Mahu, Naing is confident. “Now we have control over chainsaws in this country,” he said, adding that between 2014 to the end of 2016, they seized a total of 746 illegal chainsaws. Most of those come from individuals owners and are handed over to the MTE. A major problem with monitoring illegal chainsaws is lack of control in insurgency areas, especially Kachin state in Northern Myanmar. Kachin shares a long border with China and is largely controlled by Kachin Independence organization (KIO) and its armed group Kachin Independent Army (KIA). They have an estimated 8,000 troops and are believed to be involved in illegal logging. They face myriad challenges, some of which could be life and death. In fact, Naing doesn’t think there is a clear connection between seized timber and registered chainsaws, especially since the registry is so new. The forestry department is also still in the process of getting its staff and other government agencies up to speed on the registry’s use. If it proves effective, it could have an impact. 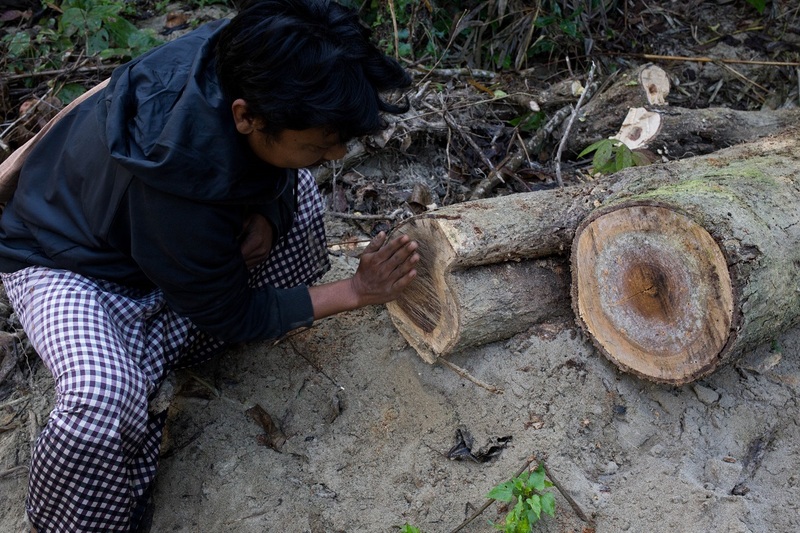 “If we control chainsaws, it will reduce illegal logging in the future,” Naing said. He added that one way they are doing this is through outreach programs, which include group information sessions on how to register chainsaws and the impact to the environment from illegal logging. In January 2017, he said they held 286 chainsaw registry outreach sessions across the country. Despite complaints over the complicated procedure to obtain a chainsaw, Naing sees the approach as standard. In Mahu, logging is slowly transforming the lives of the villagers, although not everyone can yet afford to purchase a chainsaw. Khin Mg Htwe is 32 years old, tan and lean from years of rice farming before he turned to working as a timber porter. “I don’t know how to operate a chainsaw, and I can’t afford one yet, but I’m happy they are cutting wood so I can make some income by transporting the timber out of our village,” Htwe said. 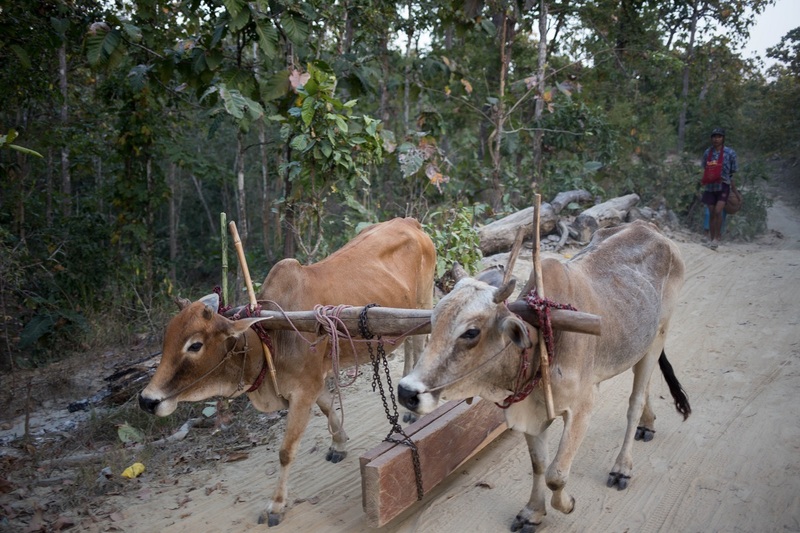 Transporting logs with cows that are usually for farming near Mahu. The porter can usually earn almost $4 per pair haul with a pair of cows. Photo by Ann Wang for Mongabay. The 4-hour round trip by foot to the nearest village involves tying the timber to his two cows and a two-day rest after each trip. He makes a mere $4 each time. 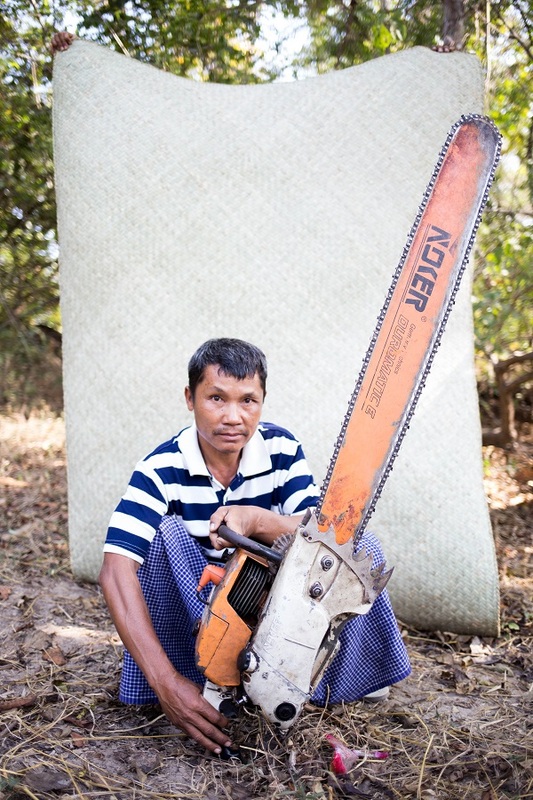 Thar Kyi is a 32-year-old father of four, and is recognized as a chainsaw expert by other villagers, who joke that he cuts the straightest line with chainsaws. 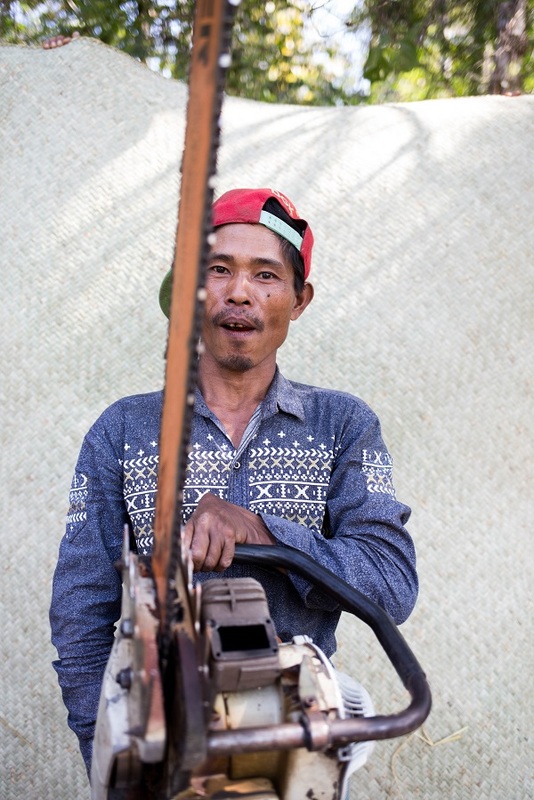 Like Htwe, Kyi doesn’t own a chainsaw and is hired by chainsaw owners for $4 per day to operate their machinery. He said that part of his motivation is based on family obligations. “I have to pay $5 for my kids [per child] to go to school per month,” Kyi said. Though primary education is free in Myanmar, teachers often ask for extra money in rural areas to offset the cost of uniforms and books. Even though activist Htut is devoted to conservation and to preventing illegal logging, he is sympathetic to the villagers. He doesn’t believe that stricter enforcement of chainsaw regulations will stop the loggers. “They will just go back to using axes and handsaws, the illegal logging will continue and so will the bribery to related governmental officials,” he said. 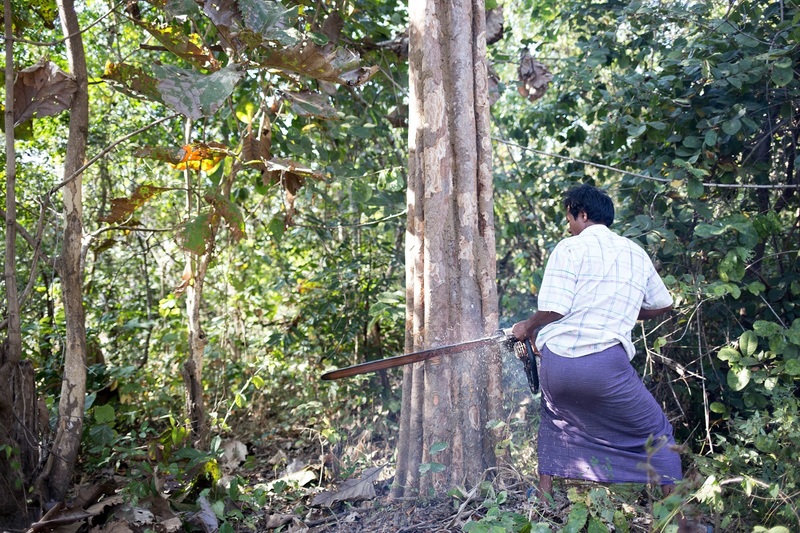 Banner image: A villager from Mahu cuts down a tree using a midsize chainsaw. A chainsaw can cut down a tree four times faster than an axe and handsaw. Photo by Ann Wang for Mongabay. Ann Wang is a foreign correspondent and photojournalist based in Myanmar. You can find her on Instagram at AnnWang077.